How to green your bathroom without scarifying style. 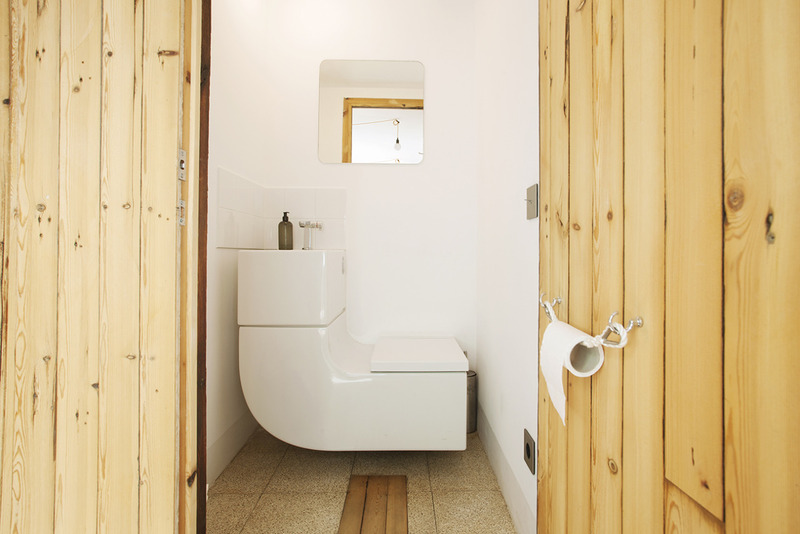 It seems there is more to tackle than saving water when you want to go green in the bathroom. A while back, I wrote about why reclaimed sinks were the most eco-friendly option for wash basins at yök Casa + Cultura. Regarding mirrors, the most eco-friendly option, since they are not recyclable, is also to choose them second hand. This, as with all reused objects, avoids more of them being made. In general, we tried to use as less material as possible without making the bathrooms uncomfortable. Instead of shelves for example, we placed plenty of hooks on the walls. When it comes to the wet areas, we only covered those with tiles that needed to, like the inside of the shower and the bit above the sink. These square coloured tiles are the classic bathroom tiles used in Barcelona. Made in Spain by Fabresa, dry clay is locally obtained and undergoes a quick double firing process, saving energy and CO2 emissions both in the transportation and in the fabrication process. As with all tiles, it will be difficult to recycle them (only a downcycling is possible), which is why it is important to choose a timeless design, good quality material and as less surface as possible. The rest of the walls are painted with white low-VOC paint, suitable for humid environments. Most of the floors have a fabulous mosaic flooring from 1900 which we restored. Where areas were missing (one of the rooms used to house the kitchen, which didn’t have a noble floor) we just filled up the small area with cement and sealed it. We managed to avoid shower curtains, usually made from PVC and not long-lasting, by installing recyclable glass doors. The lights are second hand porcelain arms which we rewired so that they can fit LED bulbs. The vintage switches and plugs are new and very long-lasting as they are made of porcelain. They are also made locally, by Fontini. After careful studies by Xavier Mor from Renòwatt, we came to the conclusion that the greenest option to heat our hot water for the showers are efficient gas heaters if we offset the CO2 emissions; which we will! Last but not least comes the water in the bathrooms. At yök we do not only work hard to save energy, but also water. According to Airbnb, guests in Europe renting a home use 45% less water than when staying in a hotel. Even though, there is a lot one can do to reduce the water consumption in holiday lettings, especially in a country that is feeling the stress of the water crisis. Here is a recap: we installed Roca’s L20 series of shower heads and faucets. They are equipped with aerators and Cold Start, meaning the hot water is only triggered if you move the handle to the left. Most taps fire up the hot water every time you lift the handle in the middle position, wasting energy unnecessarily. The toilets have a dual-flush system as it is the easiest for guests from all different cultures to understand without having to leave instructions. Upstairs in our office, we installed the w+w toilet by Roca (top photo). It recycles the water used in the sink to flush the toilet. However, as it is made from a huge amount of un-upcyclable material (porcelain), we are not sure saving some water will make up for that. In fact, Roca had LEED analyse their different toilets and some of them, like the Meridian series we installed in the apartments, save the same or more water depending on how you use it. In the end however, we installed it not only as a water-saving and conservation maker (this is definitely working) but for space-saving reasons. The only way we could fit a toilet and sink in the small space provided was to install the w+w. Coming up next are our branded soap dispensers to remind our guests that water is precious while they soap themselves with 100% natural citrus soap made in Valencia.